AUGUSTA, Ga. — This time, the doctor needed a doctor. Jones Creek Golf Club has some nice elevation changes. 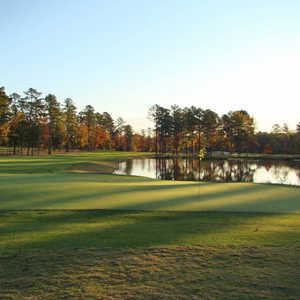 Jones Creek Golf Club, one of the courses in and around Augusta and the hallowed grounds of Augusta National, was designed by Rees Jones, son of Robert Trent Jones, and a man known as the "Open Doctor" for his prowess in preparing courses for the rigors of the U.S. Open. Jones Creek opened in 1985 with a slam-dunk reputation; it garnered some impressive honors from various publications, among them being named one of the best new courses in the country, the top public course in Georgia and one of the top 100 places to play in the U.S. It's also been the site of PGA Tour qualifying. The course then went through several ownership changes, with the course suffering through various stages of neglect. Finally, a group of mostly local investors ended up with it, and decided to restore it to its former glory. They called in Tom Fazio to tinker with Jones' original design. "From 100 yards in, everything is different," said Head Professional Pete Carroll. Fazio is known for his artistic bunkering, at his best, and he changed the bunkering around the green complexes, softening them a bit and shaping them. Jones, a devotee of more traditional bunkers, is hard-edged for the most part when it comes to bunkers. The greens were changed as well, and are now not as sloped or undulating. They were also switched from bentgrass, probably the truest putting surface, but notoriously difficult to maintain this far south, to TifEagle. The greens are more receptive, and the surrounds and collection areas give golfers second chances. The result is a course that is supposed to leave you smiling rather than cursing. 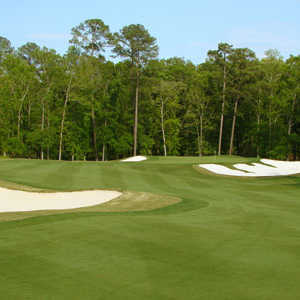 "You can afford to miss it now, whereas before, you were penalized heavily for missing with your irons," Carroll said. "It's more player-friendly." Jones Creek has too many homes around it — some too close for comfort — to be considered beautiful, but it does have the elevation typical of other courses in the area, and shows off some nice views of the surrounding countryside. There are some breathy climbs, particularly the cart path ride that takes you up to No. 9. And there are some tough holes. The two finishing holes are testers, the 466-yard, par-4 17th bends off to the left, with fairways bunkers both sides and tall pines making cutting the corner difficult; the result is you're left with a long iron in if you don't hit a perfect, long draw. No. 18 is a 424-yard par 4 with a downhill drive to a fairway that twists right. 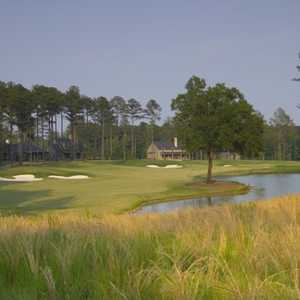 Jones Creek is a good course, more than 6,900 yards from the back tees, and is well laid out on the 520-acre site. Neither the greens nor the elevations are as dramatic as some other Augusta area courses, like Mount Vintage Plantation for example, but it will still throw enough elevation at you to keep it interesting. The fairways twist and turn and have excellent movement. In fact, hitting the ball off the tee is your main challenge here. "It has demanding tee shots," Carroll said. "To score well here, you have to be in the fairway. You don't necessarily have to hit your driver all day. It can be a different course from day to day — it's not drive, chip and putt all the time." There is not an abundance of water, but the creek running along No. 13 — Jones Creek — adds character to the layout. "That's a course I've always enjoyed," said Wayne Howell, a mid-handicapper from South Carolina. "For some reason, I always seem to shoot pretty low there, for me anyway." The Radisson Riverfront Hotel is in downtown Augusta, with South Carolina just to the east across the Savannah River. The city's riverwalk meanders right by the hotel, and the crowds show up here the first Friday of every month, a social event known here as, what else, First Fridays. The hotel is within walking distance of shops, restaurants, museums and marinas. It has 237 rooms, including two whirlpool suites, a business center, high-speed Internet access in the rooms — for about $10 — and 45,000-square-feet of meeting space in 22 rooms. It's a good, central location for playing Augusta's golf courses. Augustino's at the Radisson has a pasta bar every Friday evening and with Sunday brunches. It's an Italian restaurant serving a variety of steaks and chops, with prawns, and other entrees like salmone alla aglio e burro — pan-seared Atlantic salmon — beef tournedos, veal scallopine, and chicken picatta. A number of other restaurants are within walking distance of the hotel. The practice range at Jones Creek has covered hitting areas along the back of the tee.